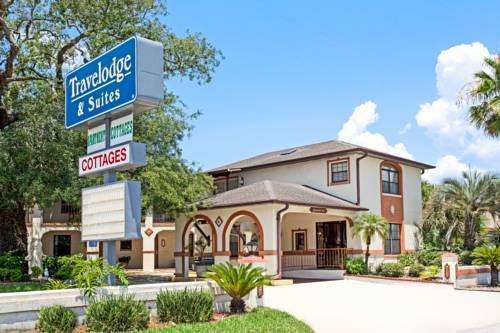 Stay at the Travelodge Suites St. Augustine hotel, located just off Route 1 and mere steps from the historic district. This hotel offers comfortable accommodations at a budget rate, making it a first choice among St. Augustine hotels and motels. Enjoy accommodations ranging from a cottage with a private patio porch, to an 800-square-foot apartment for up to seven people with a sundeck. Amenities include free Wi-Fi Internet access, a microwave and refrigerator, outdoor pool and free Bear Bites continental breakfast each morning. Historic downtown St. Augustine and the Lightner Museum are not far, and pristine beaches at Vilano Beach and St. Augustine Beach are also nearby. Also nearby are a variety of restaurants to enjoy, from Johnny's to Mexican food at El Potro, a short walk away. ~2 miles from Saint Augustine. ~34 miles from Saint Augustine. A car museum for people who usually don't like car museums, because dragsters aren't really cars -- they're horizontal missiles with wheels. ~79 miles from Saint Augustine.